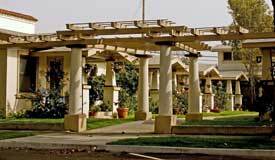 The first bungalow court, designed by Sylvanus Marston, was built in Pasadena in 1909. The style had its roots in either the Spanish patio villa or the summer cabin resort in the woods. The architectural styles of the courts varied widely from Swiss Chalet to Spanish Colonial Revival to Tudor Revival. The typical bungalow court consisted of six to ten small, individual houses placed around a communal garden. Enclosed courts had a structure, often a larger unit, at the end of the open space that created the U shape. Parking was generally at the rear of the units. 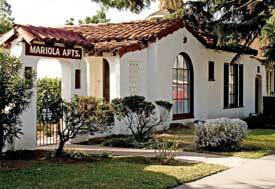 From 1910 to 1930, bungalow courts were the dominant multi-family dwelling type in Southern California. Courtyard housing was a new type of housing that provided both a house and garden for those who could not afford a single-family home or didn't want to be bothered with the upkeep. Unobtrusive bungalow courts blended beautifully within neighborhoods of single-family homes. They offered residents both a sense of community and shared responsibility while allowing for individual space and private gardens. After World War II, emphasis was placed on building single-family homes in newly developing suburbs. When the development of rental housing began in earnest in the 1960s, bungalow courts were replaced with larger, boxlike, impersonal apartments that allowed for much higher housing density. 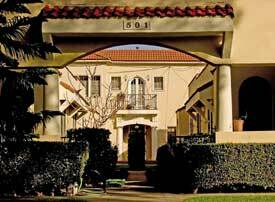 In Fullerton in the 1920s, the preferred form of multi-housing was the bungalow court. More bungalow courts were constructed in Fullerton than any other city in Orange County, and Fullerton now has five of the eight extant bungalow courts remaining in Orange County: San Souci Court (501 W. Whiting), Mariola Apartments (520 E. Commonwealth), Pomona Bungalow Court (314 N. Pomona), Rose Court (125 Ellis Place), and Truslow Court (424 E. Truslow). Unlike apartments, there was no social or economic stigma attached to living in a bungalow court, which represented stability and maintained a semblance of suburban gentility. The courts were easily constructed on a typical single lot and were situated among single-family homes in upper, middle, and even low-income neighborhoods. Truslow Court was constructed specifically to house poorer railroad workers living next to the tracks. The bungalow courts in Fullerton, which provided six to ten rental units, were laid-out in a U-shape, with a two-story unit at the end of the court serving as a visual focus. All of Fullerton's bungalow courts were situated within walking distance of the downtown area to provide quick access to social, economic, and transportation amenities. Chase, Laura. "Eden in the Orange Grove: Bungalows and Courtyard Houses in Los Angeles." Landscape vol. 25 (1981): 29-36. Edwards, Brian. Courtyard Housing: Past, Present and Future. Philadelphia: Taylor and Francis, 2005. Polyzoides, Stefanos, Roger Sherwood, and James Tice. Courtyard Housing in Los Angeles: A Typological Analysis. 2 nd ed. San Francisco: Chronicle Books, 1996.